Mediocre Musician: So you want to learn slack key? Here are the best places to start! 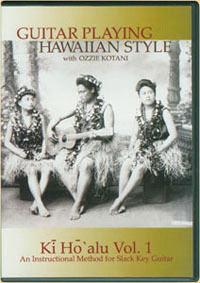 Ozzie Kotani's book, "Guitar Playing Hawaiian Style" is often regarded as the beginner's slack-key bible. If you're like me though, you much prefer video to see and hear in real-time. And if his book is the bible, his DVD's are the holy grail. Ozzie presents clear, organized lessons, with a refined and encouraging teaching style. His goal is to get you playing music quickly, while teaching fundamentals along the way. Volume 1 had me playing within minutes (and is more than enough to get you going). Volume 2 picks up from Volume 1 with much more emphasis on content--lessons move at a faster pace, but feature more songs, and venture into new tunings. Another great series of video lessons. Unlike Ozzie who grew up with slack-key in Hawaii, Mark brings a unique perspective to the table as mainlander who sought out learning to play later in life. The earlier videos are little rough around the edges (and with every lesson comes a story), but become more focused as the lessons go along. 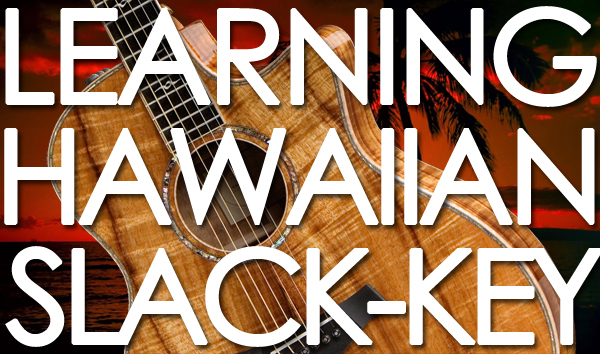 What's great about Mark's lessons is he covers a lot of Hawaiian standards that aren't in Ozzie's Vol 1 DVD, so when combined, you'll find yourself with a wide set list. Quick tip: You can get a code for a free week of access to jamplay.com on Mark's site! THE place to go for everything else--info, recommendations, answers to questions, or even people in your area looking to play! 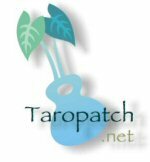 Activity on the forum is a bit slow, but everyone is very friendly and willing to share.